Anders Thomsen (left) will ride through the pain barrier for Panthers in their play-off semi-final. Joint boss Dale Allitt is determined to ensure Peterborough Panthers pass their toughest test yet to continue a remarkable challenge for Premier League title glory. The city club are gearing up for a play-off semi-final showdown against reigning champions Edinburgh with the opening leg taking place at the East of England Showground on Sunday (October 4, 5pm). The Monarchs have already captured the League Cup crown after a final demolition of fierce Scottish rivals Glasgow last weekend and they could be double-winners by the time they arrive in the city. They host Somerset in the second leg of the KO Cup final tonight (October 2) when needing to turnaround an eight-point deficit. They also finished 10 points clear of Panthers when topping the regular-season standings, but Allitt insists that will count for little in the heat of play-off battle. Allitt said: “A few months ago we didn’t even have a speedway team in this city. Now look where we are. “This is the biggest meeting the club has been involved in for a hell of a long time and hopefully the people of Peterborough will turn out in great numbers again. “I’m delighted that we have the home leg first as I always prefer to defend in the second leg rather than have to chase. “But we cannot look beyond Sunday. Our job is to win at the Showground and ensure we have a lead to take up to Scotland. “People can make their own conclusions about who will be favourites and who will be underdogs. “The Edinburgh team really doesn’t interest me. All that concerns me is ensuring we do ourselves justice. Panthers hope to track a full, seven-man team against Edinburgh after Anders Thomsen vowed to race on through the pain of a broken scaphoid sustained in a crash last Sunday. The World Under 21 Championship silver medallist’s left hand was put in plaster after a visit to hospital, but he will have it cut off to take his place in the city team. 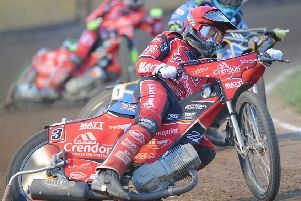 Reserve Rafal Konopka will race on bikes usually used by injured captain Ulrich Ostergaard in a bid to boost his form while Edinburgh have major doubts over German ace Kevin Wolbert and reserve Max Clegg. The second leg is scheduled for Friday, October 9. PANTHERS: TBC, Michael Palm Toft, Anders Thomsen, Simon Lambert, Ben Barker, Rafal Konopka, Emil Grondal. EDINBURGH: Craig Cook, Justin Sedgmen, Kevin Wolbert, Erik Riss, Sam Masters, Max Clegg, Robert Branford.